It's a Pirate Party! 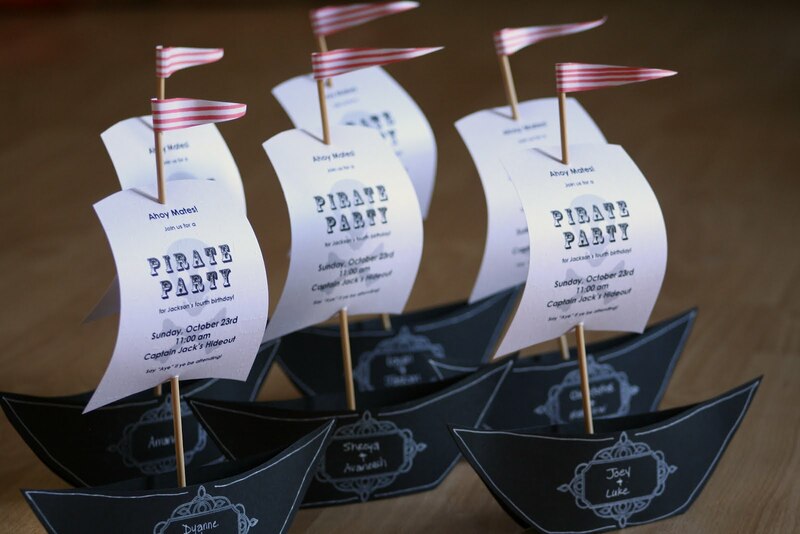 Here's a comprehensive post on my son's Pirate Birthday Party, organized into sections: Invitations, Activities, Games, Food/Menu, Cake, Favors, and Decorations. There are so many things you can do on your own with a Pirate theme, stay on a budget, and still have it looking good. Most of the kids in attendance were three-year-olds to eight-year-olds, and they were all entertained fairly equally. So hang on. It's a rather long post, but hopefully you will get some ideas on what (or what NOT) to do for your own party. These pirate ship invitations are unbelievably simple to create. 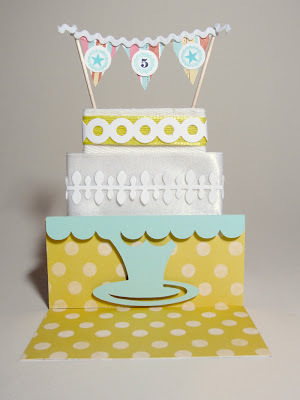 A sail shape is cut around the printed party information, embossed to make it look like a piece of linen, and hole-punched so a bamboo skewer can slide through it. The skewer is anchored by a big marshmallow that is wedged between the sides of the black ship. I wrote the kids' names on each pirate ship in white, inside a white stamped frame. Luckily we only had to mail a few of these out. For those, we instructed the recipient to use their own marshmallow to hold the sail up. For the others, my son had a ball being "mailman" and delivering the invitations personally to his friends. You'll see the font and clip art from the sail on other things throughout the party to tie it all together. While the kids are arriving we have two activities - a pirate tattoo station (operated by the helpful Daddy sitting on the floor who was quickly enlisted into action) and an ocean-in-a-bottle craft (run by the helpful mommy on the right who was asked ahead of time to lead this one). It took me a couple years of being totally exhausted during our parties, and not having any photos of them, to realize ... I could actually ask others for help!! Running activities and crafts, serving food, collecting wrapping paper, taking photos, scooping ice cream, it all can be outsourced. As a mom attending parties I would rather help out than stand around. Much, much better this way! You can see the ocean-in-a-bottle craft on the counter above. 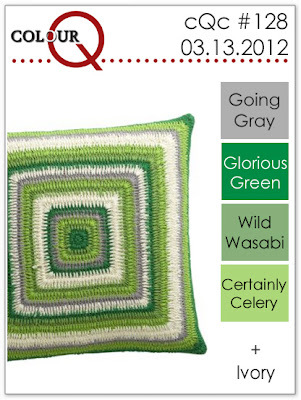 These are fun to make, and fun to play with! The oil and water stay separate, so when you tilt the bottle back and forth it looks like waves tossing the little fish and shells around. Here are instructions: Save your empty plastic water bottles, pre-fill them one-third full with vegetable oil, and write the children's name or initials on the cap. Putting names on the cap ahead of time will help avoid any confusion later. At the party, let the kids pour blue water into the water bottle (using a funnel), and add various small sea creatures. You can get packs from the dollar store, or I just raided my childrens' collection. We also took apart a shell necklace (anyone remember these from the late 70s?) and let the kids put the tiny shells in. If you're up for it, I've seen glitter used too, but the kind I tried just floated on top and didn't do much for the mess it caused. When all the kids have made their oceans, have your helpful Mom friend take them to an out-of-the-way place and hot glue the caps onto the bottles. You don't want them leaking all over! Once all the kids arrived, it was time to initiate them into service. They are joining a pirate crew to find some long lost treasure. Everyone gets a new pirate name. In our party, we had Connor the Cannon, Fishfood Kaitlyn, Dirty Cale, Old Sealegs Tessa, Evil-Eye Rhett, Mandy Man-Eater, Bones Brayden, Landlubber Layla, Gold Toothe Humza, Three Fingers Nuha, One-Eyed Christopher, Peglegged Joey, Sword Swallower Dayyan, Fishlips Mona. And the two babies in attendance were Poopdeck Matthew and Toothless Luke! Each child got a skeleton necklace with their pirate name on it. The dollar store sells the skeletons 3/$1, then I added baker's twine to make the necklace. A strip of paper with their pirate name is wrapped across the ribs to complete the necklace. Sorry for the poor quality of the photo ... I had to do an extreme crop on one of the party-goers to get a picture of the necklace! The head pirate (me, talking in a pirate-y voice) showed everyone the treasure map and explained that each location hides a part of their pirate costume, to be earned at the games later. We made the map from a Trader Joe's grocery bag, crumpled it up, and burned the edges. This put the birthday boy over the top - he LOVED watching the fire on his map. In fact, as I write this 6 months later, he has just run upstairs to draw his own map so we can do it again. His older brother was also inspired at the time and made his own map. Fun project! The birthday boy got to hold the map and everyone had to work together to figure out the clues. Some were harder than others. The bird cage was an actual decorative bird cage that sits on my end table which held the eye patches. But the rectangle with 3 squares represented our couch which hid the large swords underneath. Perfect for a variety of ages ... the three-year-olds get the birdcage clue, and the eight-year-olds can figure out what the rectangle with 3 squares is. Eye patches are hidden behind this pirate flag, and mustaches, swords, hooks, sashes, hats are hidden throughout the living room. We also hid gold coins throughout the house for filler activities as kids finished games/lunch/cake at different times. This came in handy, as the kids loved finding the gold coins throughout the party. 1) Captain Hook's Pretzels. This was a fun one! You have 30 seconds to hook as many pretzels as you can. This is good for a wide range of ages. The young ones (ages 3-4) do just as well as the older ones (ages 7-8). If you don't have a hook, you can use a black cup with a candy cane sticking out the bottom. 2) Shark-Infested Waters. This game is to see who can brave the shark-infested waters and grab as many coins and gems as they can in 30 seconds. We used the sashes I made for pirate belts as blindfolds. I was able to use the many plastic sharks, squids, octopus, etc. that my kids already own to patrol the water. The coins were left over from the large bag I bought to hide throughout the house, and the gems are from Michaels. The coins float and the gems sink so they take different skills to grab. 3) Tick-tock, Don't Get Eaten by the Croc. This runs exactly like hot potato ... whoever is holding the croc when the music turns off is out. Then repeat until the last child is left. Judging by my son's joyful expression holding the croc, I don't think he understood the rules very well! 4) Swab the Decks Relay. Divide into two teams, each team has 5 ping pong balls that they need to sweep over to the other side and back. I spray painted one set of balls gold so they didn't get mixed up. This is one of those games that sounded really neat when I read about it, but the execution wasn't so great. I think having a small area to play it in really hurt. It was pretty much chaos! Balls went all over and people got mixed up. 5) Pin your Eye Patch on the Pirate Flag. 6) Musical Islands. This runs just like musical chairs, only the kids hop on an island (round shapes cut out of paper) instead of sitting on a chair when the music stops. After the kids finished each of the games, they got to receive a piece of their pirate costume. The mustache/beard combo was my favorite - it looked hilarious on everyone! They were easy to make too. I got some black fur material from Joann's (1/8 yard was less than $1), made a template, then cut them out. I read a bunch of different ways online to get them to stick, but since I didn't want to spend a ton of money I just used some double-sided tape and that worked well enough. After sticking the tape on the mustache, I pressed my finger on the remaining sticky side a couple times so it wouldn't stick so tightly to their skin. Here's the main food table the night before (technically, it was probably the morning before, maybe like 3:00am ?!?) I grabbed a frame that held a family photo and taped a sign over the glass that said, "Captain Jack's, Grub and Grog for Yer Hardies and Lassies." I used the same sail template with the skull and cross bones watermark and font to label each of the food items. The treasure chest full of pretzels from the Captain Hook game is put into service again (with fresh pretzels!) on the food table. The hook is left for people to use as a server. It was fun coming up with Pirate names for the food. It's the first time I've had wraps at a party, and I rather liked it. Small servings for the kids, and easy to make. These were re-named "Bone Slices." And orange slice pirate ships "floating" in blue jello. Super easy to make, and cute! I got the idea from pinterest here. Water bottle printables have been so popular, and I love the idea of customizing them for your party. So easy! Again with the same design as the invitations and food labels, I created strips for "Shark's Blood" and wrapped them around the bottle. A little Kool-Aid drink mix makes them all red. This was another favorite, although next time I'll get the smaller sized bottles. There were lots of 3/4 full bottles laying around, and I forgot to leave a marker to label bottles. Making a pirate ship birthday cake had me a little nervous, so I did this a couple weeks ahead of time to make sure it would turn out. I've never had a problem freezing cakes so I wasn't worried about doing this so far ahead. The best part is that it was amazingly simple to make. One box of cake mix (I add crushed mandarin oranges and the juice to spruce up the boxed cake mix) makes two round cakes. Cut these in half, stack the four layers on top of each other (frost in between), and with a large, sharp knife cut around the edges so they are smooth and even. Slice the rounded end off so the ship has a flat surface to stand. Frost the outside. The planks were cut from a sheet of fondant. Use black icing to outline the ship, write the Birthday Captain's name, make portholes for the cannons, and any other details. The candles made great cannons (the whole "fire" thing) and the birthday boy had a blast blowing them out. The sails again have the same theme as the invitations, food labels, and water bottles. We put big 4's on the sails for his new age. Because the cake wasn't overly big, I wanted to have some cupcakes in case we needed more servings. These turned out to make great islands! Crumbled cookies on top made the sand, and I used the silicone cupcake holders to give them some more color. Raiding my kids' toys provided several palm trees, sharks, treasure chests, left-over gold rocks and other piratey props for the scene. When possible, I try to have party favors that aren't packaged as "favors" in a party store. For this party I thought it would be fun to give the kids their own bag of gold and other shiny treats. Plain white lunch bags have a skull and crossbones design that was cut out of material and stapled to the front. I only needed 1/8 of a yard of the skull and crossbones netting from Joanns for all the bags. The tops of the bags are tied with jute and have a heart and crossbones stamped tag with the party guest's name written inside the heart. Here's a look inside the bag. I bought a bag of smooth rocks from Home Depot for $3, rinsed them off, laid them out on a large sheet of cardboard to dry, and went to town with the shiny gold spray paint. It did take a little longer than I anticipated to make sure all the sides were coated. But still a very quick and easy project. I put a few shiny gold candies in as well, like Twix, Hershey's Almond bars, Hershey's hugs (those are gold instead of the silver for kisses), and mini Snickers. The bags all sat in a skeleton box I had for Halloween decorations, on top of a satin red material (also cheap from Joann's). Both of my boys still play with the gold rocks quite often. Anytime there's a scene with treasure to guard or hide they get called into action. In fact, the younger one was a little uncomfortable that we were giving away all this gold! Another mom told me her kids used the gold recently for a school project. Although most of the kids were wearing the pirate accessories out of the house, in hindsight I should have had a bigger bag ready for anything they chose not to wear, and the ocean in a bottle. The cost of these favors for 17 kids was about $45, so only $3/child. Many of the decorations are on the buffet that's right by our front door. It made a nice spot to put presents under, and was handy to pass favors out as people left (the top row of white favor bags are in the skeleton box). I was happy to use many of my son's pirate toys as decor. Above the white favor bags sits a pirate ghost ship, and another brown pirate ship is in front of the chalkboard. We had a few more ships and pirates scattered throughout the house. We ended up with several extra pirate eye patches, and since I had the Halloween decorations out, I took the opportunity to give every "face" an eye patch. So gourd people, ghouls, jack-o-lanterns, witches, all got enhanced. You can see the skeleton hanging from the stair railing with an eye patch. Quick and easy. A close-up of the chalkboard on the buffet with a birthday message for Jackson. You can see part of the brown pirate ship and a Halloween tree in the foreground, along with a globe I had from Crate and Barrel. All year we have a reversible banner hanging in the dining room. Most of the year the neutral side is showing and I put up letters spelling Merry Christmas, Happy Easter, Happy Halloween, etc. You can take a look at the Happy Valentine's version. 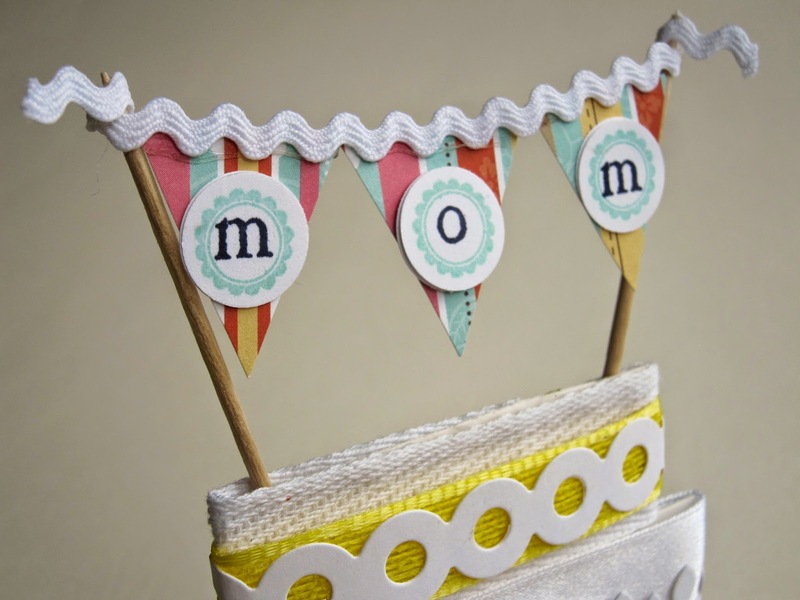 But whenever there's a birthday in the house I flip the whole banner over and use the Happy Birthday side. I usually just put up a number for the age, but I happened to have a Cricut Die-cutting cartridge that has a pirate ship on it that I've been anxious to use. So I did that and die cut a number 4 for the sail. Not necessarily a "decoration," but I think it adds to the fun when kids see an adult in a theme-appropriate costume. That little red blob on my shoulder is a stuffed parrot. Way out of proportion, but it was the best I could do after shopping through their stuffed animal bin. The tray I'm holding has the pirate outfit pieces as they were being discovered during the treasure hunt (eye patches, mustaches, hooks, sashes). 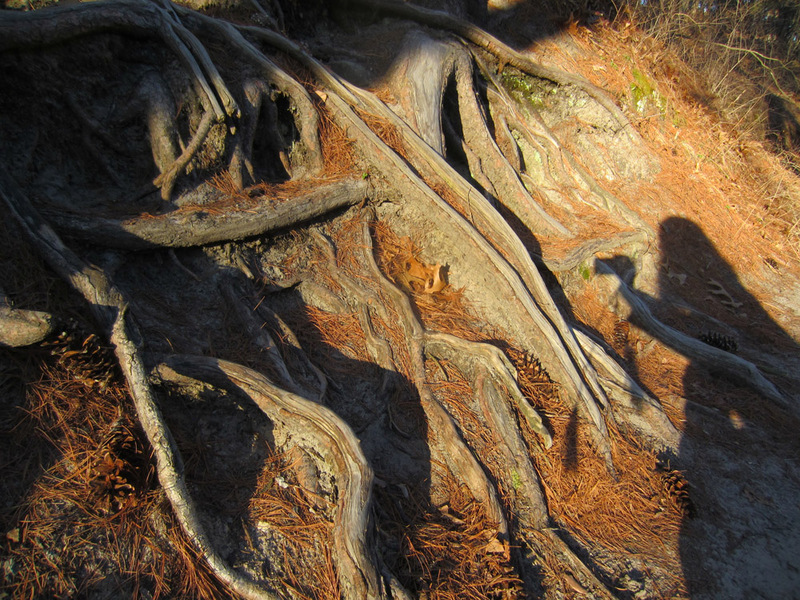 This is a "before-and-after" photo of sorts. The first photo is the birthday boy at his party in a state of undress. Just pants and a hat. No convincing could get more clothes on him. But it's his birthday, and that's how he rolls! The next photo is of him the day before in his full costume for trick-or-treating, Jack Sparrow dreadlocks and all. As the sign says, "All Ye Scurvey Dogs Must Walk the Gangplank or Ye Be Thrown Over!!" There was lots of gang-plank activity coming and leaving the party. The birthday boy's grandparents so kindly made this ramp and sprayed it black. Not only was it a hit at the party, but we've been using it all year and still have it on our front porch. The kids love it, and it's come in handy when moving furniture into and out of the house. Bonus! Above you can see one of the three Jolly Roger pirate flags we ordered from eBay. I think they were only $8/flag ... this was our biggest expense for the party by far! It's nice to have a first impression before coming into the party, and this is an easy and big way to do it. Not sure if you can see in the photo above, but the shiny circles of gold hanging from the ceiling are left-over gold coins that I hung in strands taped to invisible fishing line. These really shine in the sun and add a lot of sparkle. I hung several strings of coins inside too, in more out of the way places or up high. Good to have decorations at eye-level, which isn't always easy to do. Next time I would make the outside strings shorter so they don't tangle with each other in the wind. Also as you enter the party is a skeleton warning "Captain Jack's Hideout. Enter at Yer Own Risk. Pirates Inside. Arrr!" Well you've made it through this very long post! Another apology for any photo quality issues, or lack of photo composition. These were all taken for personal use before I started a blog. 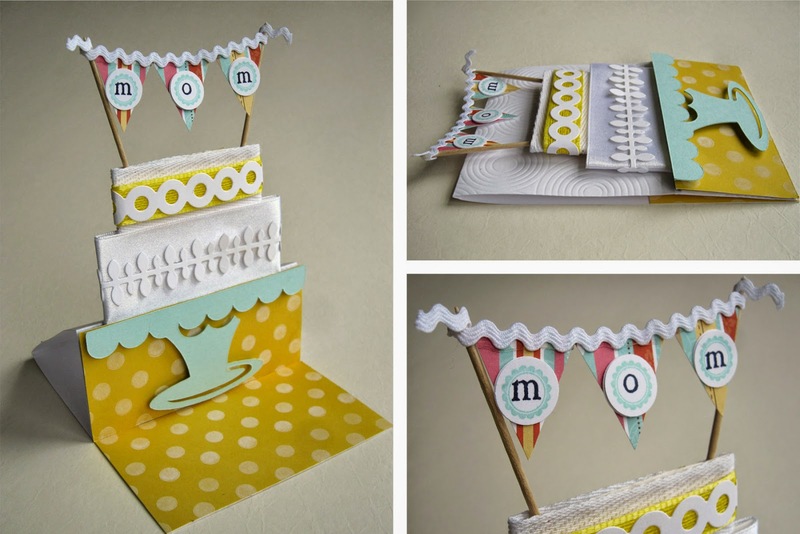 The free photo template above came from Rebecca Cooper of Simple as That. Also if you have any questions please let me know and I'd be happy to try and answer them. Thanks for stopping by! Arrr! 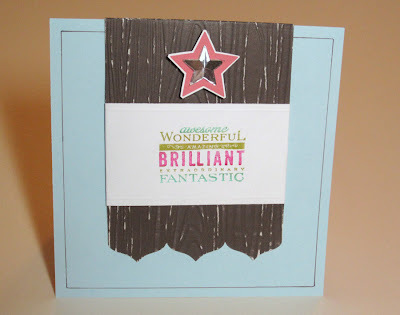 Step-by-step directions to make an easel card are on a helpful Split Coast Stampers post. But if you're like me and would rather just do it quickly instead of read instructions, here's a hint. 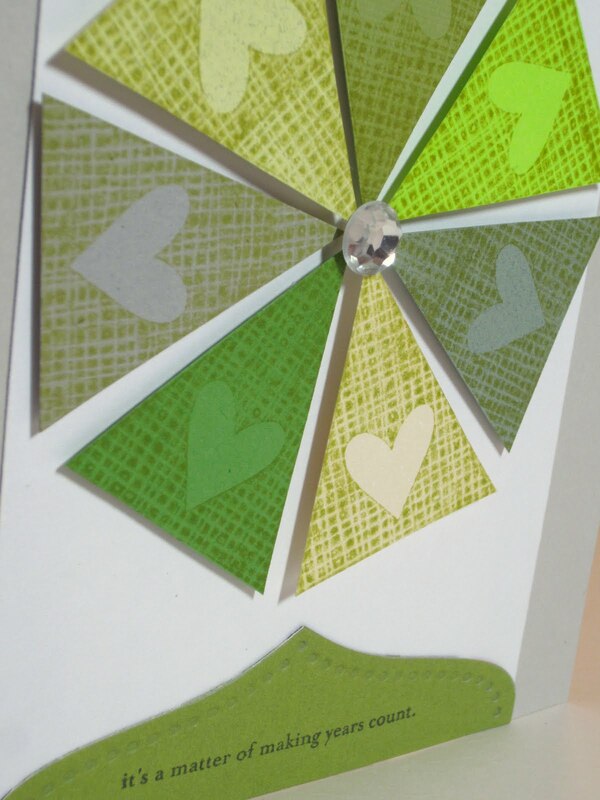 All you need to do is fold the upper flap of your card inward about 2" from the bottom. 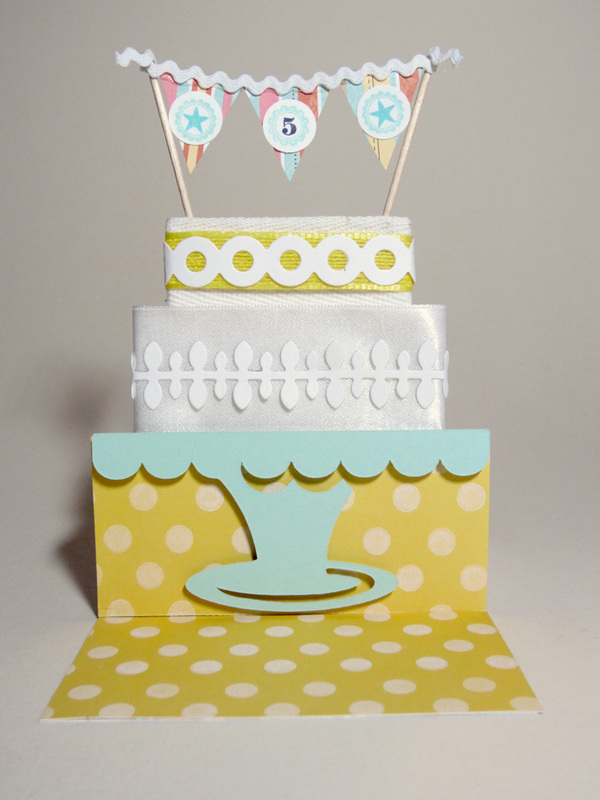 Attach your main part of the card (in this case the cake, strip of yellow polkadots, cake stand) to the 2" flap, and there you have it. 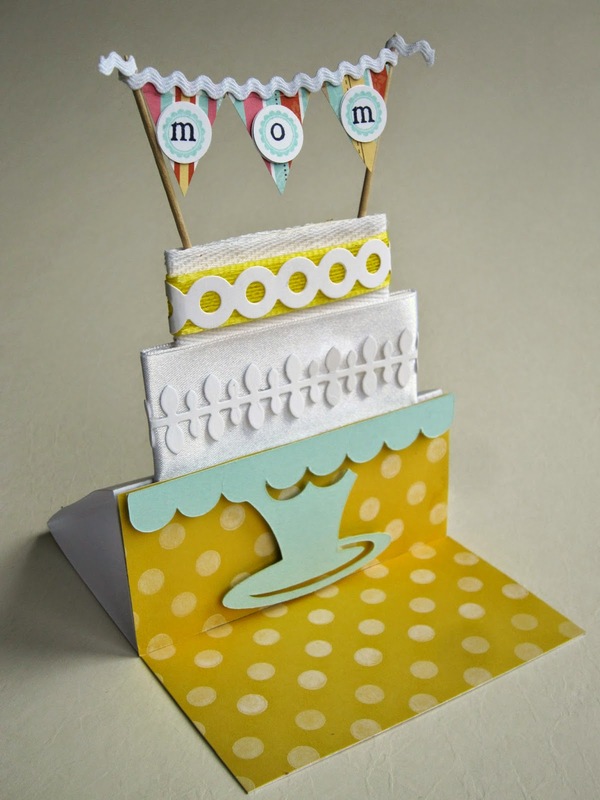 An easel card! If you want the easel to stand better, attach another piece of paper on the lower flap of the card so the easel has a little ridge to stop it from sliding flat. Toothpicks hold up the banner on either side. I love that it folds flat too. When you lift the easel, you have additional space for a sentiment, or to write a personal message. Using a different card format is a nice change for me. 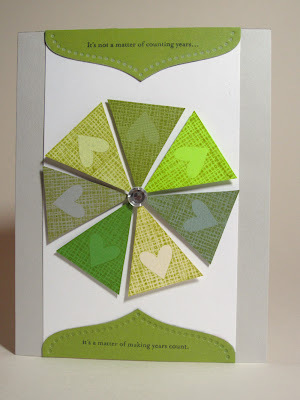 Doesn't use any more paper, just works differently than your traditional card. I had forgotten about the "kissing" technique until seeing Heather Nichol's Make It Monday video. I was surprised upon looking through my stamps that I only have a few with a large solid surface for this technique, and the best one was a Christmas tree. So, in order to avoid screaming, "hey, I'm a Christmas tree stamp," I avoided using a lot of green, and placed them around in a circle. The white text border is a definition of "family". So much fun that I made another card! This one is for the Color Q Challenge to use green, beige and gray. 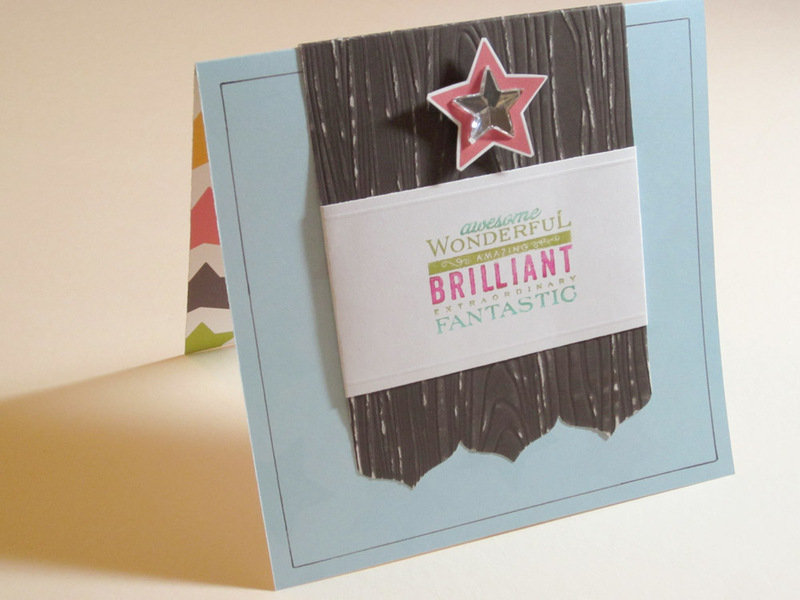 For this card, the trees were kissed with texture only. The color is from different colored papers, rather than from the stamp, which makes for different colored hearts to show in the middle. I was happy to use one of my favorite phrases, "It's not a matter of counting years, it's a matter of making years count," as the main sentiment. The tree trunks are cut off each tree, and a big gem sits in the middle. How fortunate to spend last weekend at a water park right across the street from a canyon! In between showering all the chlorine off and enjoying dinner with the aunts/uncles/cousins, we hop across the street for a quick trail. A glorious day, sun shining low, cliffs glowing. Mom holding carefully collected nature treasures and taking photos with the same hand. 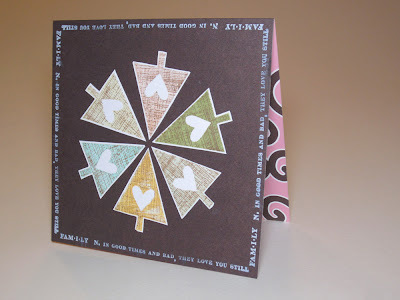 What a great idea from Betsy Veldman to die cut partial images, further extending the possibilities of your dies. Basically, you make a shim to stop the die cutter from cutting a portion of the die. I was so excited to use this idea with the Banner Borders Die, since I've always loved those dies but wished they could be full card length. Now they can! And the beauty is that this homemade purple shim is useable on any of the 5 borders to extend their length. For this card I chose the border with the three pointed sections. 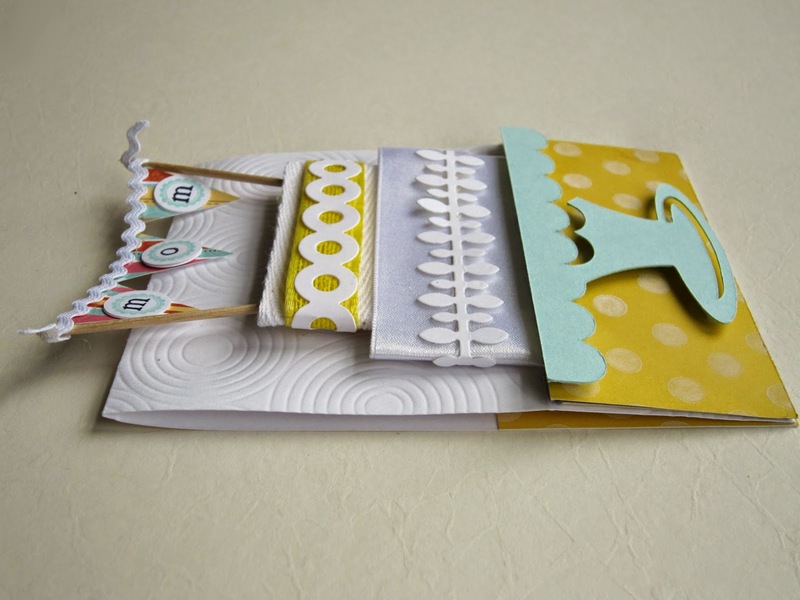 After die cutting the border, I used the paper trimmer to finish cutting the sides, making them long enough to extend down the card. The Woodgrain is sanded for a weathered look. The star is cut from the pattern on the other side of the double-sided blue card base, and the inside of the card is all stars. I like the idea at CAS-ual Friday to have the sentiment be the main portion of the card, so I'm joining that challenge. I've also used the sketch from the new retro Sketch challenge.